Amid the litany of education reforms that emphasize innovation and new methods, school gardens stand out as a low-tech change. In an era where kids' lives are more sedentary, and where childhood obesity has risen dramatically, gardens support and encourage healthful eating as a key component of children's physical wellbeing, which can aid their academic and social success, too. And as the consequences of food deserts and poor nutrition on life outcomes become starker, advocates say that school gardens can act as a counterweight — an outdoor respite for children growing up in environments that can be otherwise unsafe or barren. Where cries of "Eat your broccoli!" and "Haven't you had enough sugar?" fall flat, how exactly can school gardens prompt healthier eating habits — and what are the best practices for establishing one? Schools can — and many argue should — play a critical role in shifting children’s perceptions of food and enhancing access to healthful foods. “Every time kids set foot in the cafeteria, they are absorbing messages about food and what a healthy meal should look like,” says Bettina Elias Siegal, an expert on children and food policy. But the way schools traditionally teach nutrition isn’t working. “In far too many schools around the country, nutrition education looks like an authority figure standing at the front of the classroom pointing at a government poster on the wall. And that has been true for generations, and it has not driven the kind of healthy eating culture that our children need to succeed in school and in life,” says Curt Ellis, the CEO of FoodCorps. 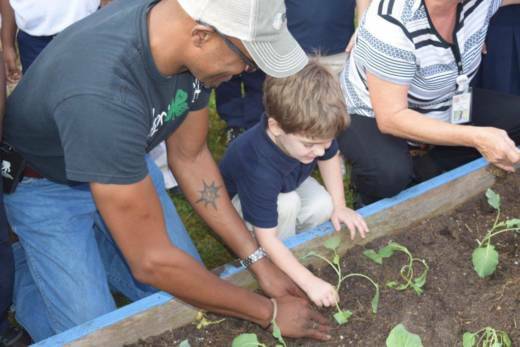 His organization has placed service members at 350 schools across the country to deliver gardening and cooking lessons and encourage a school-wide culture of health and nutrition. “Just as we have learned that rote memorization is no longer the right way to teach kids math or English skills, the same is true with nutrition education,” Ellis says. School gardens provide students with a real-time look at how food is grown. There are different models for how these gardens work, but in many, children of different ages have regular lessons in the garden, learning how to grow, harvest, and prepare a variety of fruits and vegetables. A 2017 evaluation of FoodCorps conducted by the Tisch Center for Food, Education, and Policy at Teachers College, Columbia University found that in schools that provide frequent, high-quality opportunities for hands-on nutrition learning, students eat up to three times more fruits and vegetables at school lunch — regardless of whether or not that food was grown in the garden. The effects extend outside the school day, too. A 2018 randomized control study by Nancy Wells at Cornell University found that children whose schools provided regular school garden lessons had more access to low-fat vegetables and fruit at home than children without that curricula. Why do gardens have such an impact on children’s eating habits? Unlike lectures or worksheets on healthful practices, gardens provide an experiential, hands-on learning environment, “where kids get the chance to smell the leaves of the tomato plant and eat carrots with the dirt still on,” says Ellis. Working in a garden is a real-world activity; it engages students and encourages them to explore and reason independently. While most children receive only 3.4 hours of nutrition education a year*, maintaining a school garden necessitates that nutrition lessons become a consistent, built-in part of students’ educational experience, says Eva Ringstrom, director of impact at FoodCorps. Research has shown that it takes between 35 and 50 hours of nutrition education a year to change kids’ preferences over the long term, she says. That repeated exposure can also build the emotional connections to food that are essential to behavior change. When children spend weeks or months growing their food, they feel proud of and connected to it — which is key to trying new dishes with an open mind. For educators considering planting the seeds of a gardening program at their school this year, Ellis, Ringstrom, and Siegel offer best practices on fostering a community of health and wellness. Focus on skill development — and connect it to the cafeteria, the supermarket, and home. Changing how students eat requires more than providing access to fresh foods and shifting students’ preferences. Many students need to be taught how to inspect fruit and vegetables for freshness, or how to wash and cook them. Others need help learning how to hold a lunch tray in one hand and use salad tongs with the other. Make sure your nutritional program extends from the garden to the cafeteria, to the supermarket, and to the kitchen at home. Integrate the garden into other classroom lessons. Many school gardens are run by a single teacher or volunteer, but the whole school can get involved, too. Students can make predictions and conduct experiments in the garden during science, plot out the dimensions of the garden in math, or learn about the history and politics of food access in social studies, for example. Make your approach culturally relevant and place-based. Says Ellis, “If we are doing a FoodCorps program in a largely indigenous community in the Southwest, our approach to food and food culture is going to look different from our work in the Mississippi Delta, which is different from rural Iowa.” The climate and traditions of your local community can — and should — matter when it comes to growing food. Don’t provide unhealthful food. Every way in which students interact with food at their school is a lesson on what should be part of their daily diet. When schools host near-constant fundraisers with cookies and cupcakes, or the cafeteria sells à la carte processed, “copy cat” junk food, it undermines the lessons of the garden program. Foster a mindset of exploration. Eating healthfully requires kids to be open to trying new foods. Encourage students to taste vegetables from the garden multiple ways. Remind them that liking a new food takes time — and that the same food can taste differently depending on how it's cooked. In the cafeteria, offer “tasting stations” that allow students to try different vegetables before they decide which one they’ll put on their tray. From taste tests to iPad surveys to letting students pick the menu — here are the strategies that school nutrition experts use to get kids to try new foods. And watch the video for a fun 30-second summary. *Correction: An earlier version of this article mistakenly stated that children receive 4.3 hours of nutrition per year. We regret this error.